Find everything women travelers in Vietnam need to know about health, romance, women’s rights and safety. Madalene says: Pads and pantyliners are easy to find in grocery stores (CitiMart, etc.) and smaller convenience stores (Guardian). They have Western and Vietnamese brands and quite a lot of variety but they may not have the exact one that you use. Tampons are less common and you may have to go to a Western market to find those. If you are particular about your brand/type, I recommend packing enough for your trip. Madalene says: Condoms are available in grocery stores and convenience stores. There was a news story recently about the bad quality of some imported condoms so it may be best to stick with a recognizable brand. The pill is available by prescription from doctors working at Western hospitals. The price is very reasonable, about $5 per month. They may not have the same pill you get from your own doctor so if you are particular, I recommend taking enough from home to cover your travels. Madalene says: I visited a gynecologist once during a year and it was a thorough visit. The appointment was at FV Hospital in Saigon, District 7. This is a new and modern hospital. My doctor was Vietnamese, trained in France, and also spoke English. She was professional, answered my questions, and I was comfortable with her. Her assistant emailed my lab results just a few days later. This type of hospital is expensive by Vietnamese standards but a visit is affordable by Western standards and getting an appointment was fast and easy. My visit was more expensive because it included a lot of lab work, but I believe just a routine exam is around $40. Madalene says: I didn’t see any public breastfeeding. I think it would be awkward and uncomfortable given the modest culture. Madalene says: Vietnamese people, both young and old, male and female, love love! They like melodramatic love songs and have grand ideas and expressions of love and romance. As a generalization, they date for marriage rather than casual dating but they like to go out in groups. It’s common for young adults to live at home until they get married. If they move to another city for work, they live with relatives. I met young professional women who did not want to settle down right away and if they could afford it, rented their own apartment. That is getting more common, but for the most part the dating community (which is mid-20s since most are married by 30) is more traditional than their Western counterparts. A woman should look out for charming men proclaiming their love for her and then asking for money. Madalene says: The younger generation -20s, early 30s- are generally very sweet, hard working, and still want to be the provider in the couple. I would be very wary of a Vietnamese man who doesn’t want to work and pursues a foreign woman. The “middle-aged” generation of men, who are often married and have children, or the parents of the aforementioned young adults, are often viewed as not hard-working, going out to drink at noon, and leaving the housekeeping/child-rearing/income-earning to the wife. While it’s true that you can go to a Bia Hoi (side walk beer joint) and it will be full by noon with mostly men, it’s a broad generalization to make and I met several loving and dedicated husbands/fathers in this age range. Madalene says: I met some gay expats -single and in couples- who happily lived and worked in Saigon. LGBTQ expressions of affection are not common in public but PDA is not common even among hetero couples. Madalene says: On the one hand, they celebrate International Women’s Day in March and Vietnamese Women’s Day in the fall where men will give their female colleagues flowers, take them out to lunch, etc. But there is also an attitude of perhaps misplaced chivalry that to a Western woman seems like chauvinism. I noticed gender segregation in my adult English classes of business colleagues and when we talked about women’s role in society, many men felt that women couldn’t or shouldn’t be in high-ranking government positions. This is a good blog post on the topic. Madalene says: One of the biggest differences is that local women do not travel alone, because culturally that would be considered inappropriate. So they are impressed to meet a solo female traveler. I come from an ethnically Vietnamese, first generation immigrant family so I didn’t feel like there were that many cultural differences. Most local women go to university, care very much about their studies and finding a good job. Some want to fall in love, get married, and have a family and others want to live a single life and focus on their careers. Women in rural areas might be different, but I’m not sure. Another big difference is that Vietnamese people, especially women, value fair skin and go to great lengths to make sure they don’t get sun exposure. They will be motorbiking with a zipped up sweater and a full face and neck mask. Madalene says: I visited a temple that had only nuns, who cared for children. I visited with a male friend and that was okay. In fact, I listened to chanting services in old Hanoian temples that were female-only but again, I visited with my brother so it’s not specifically woman-only. I wasn’t denied access to anything in a year of living there. Madalene says: Most of the locals, especially university-age young people, are very friendly and like to talk to Westerners to practice their English. They always respond with interest when I say I’m from America – they say they follow American pop culture, celebrities, music, etc. and like to talk about it. They ask which state I’m from and always sound interested even though most have no idea unless you’re from California or New York! I was warmly received by most of the locals, regardless of their gender and age. Sure, I encountered the occasional grouchy street vendor but for the most part, the locals love to get your business, your attention, and some of your time. Madalene says: Motorbike is the main form of transport. Get a decent helmet- it’s the law. Moto taxis will usually have an extra helmet and a face mask for the pollution. Fender benders are not uncommon, and more serious accidents happen but I think it’s because of the difference in traffic “laws” in Vietnam. I lived there for a year and did not have my own motorbike. I strongly recommend walking and riding as a passenger for at least a month to get a feel for the traffic. Additionally. I never took the bus in Saigon but I took it in Hanoi and I loved it. Cheap, frequent, goes lots of places! I felt very safe on the bus. It turned out I was too scared to bicycle in Saigon, but others did with success. I biked in Hanoi. Even though the traffic is awful there, too, there’s more of a biking culture in Hanoi and it was fine. In Saigon, no matter your mode of transport, be very careful with your bag, and if possible, don’t carry one, or just carry a wristlet. All you really need is your phone, some cash, tissues, no credit cards, and no passport. Don’t think you’re safer with a cross-body bag, either. Thieves will grab your bag–it happens to men and women, locals and foreigners. They will grab it from pedestrians and motorbike drivers and passengers. They are after your smart phone and high value electronics, as these are very expensive in Vietnam. Please don’t walk down the street talking or texting. Step into a shop if you must. Also, it’s not a good idea to use your phone for photos. If you must carry a bag, get a canvas shoulder bag like for groceries. Don’t carry an obvious purse or computer bag. There are women who’ve been pulled off of motorbikes in traffic because of their bags. Madalene says: Overall, I think Vietnam is very safe for female travelers. I often walked in the evenings alone to and from restaurants, cafes or work. That being said, be careful after dark in Bui Vien, the “backpacker” area. Stay in a group and only use a reliable xe om (moto taxi) or better yet, VinaSun taxi van. Same advice applies to Hanoi. It’s safe, just use common sense, especially after dark. Madalene says: It is hot and humid but I could not bear to wear a tank top–it was more comfortable to wear light-weight layers or quick dry athletic tops. All cotton is no good, you will sweat and it never dries out. Honestly, polyester is your friend. Look at the local ladies for what works – they are wearing matching top/pants poly sets. In a professional setting, women should not wear strapless or sleeveless. Employers also prefer closed-toe shoes. Don’t wear sandals unless they are heels. However I often got away with wearing a nice pair of leather flat sandals. Here are some inconveniences you might face while in Vietnam and tips for how to deal with them by Kaitlin Kimont. To avoid this, though, it’s best to try to learn numbers in Vietnamese and always ask, “How much?” even if it’s for something as simple as soup. Also, try to download a free Vietnamese app for common phrases. If you don’t want to deal with the hassle of bargaining or speaking Vietnamese, stick to restaurants and shops that have listed prices. I would also recommend asking your hotel what the going price is for something you want. If a vendor or salesperson quotes you a much higher price, try to bargain or just walk away. Chances are, they will follow you and lower the price. Have you traveled to Vietnam? What were your impressions? We’d love to know if there’s any important information you recommend adding to this list. Email us at editor@pinkpangea.com for information about sharing your experience and advice with the Pink Pangea community. We can’t wait to hear from you. 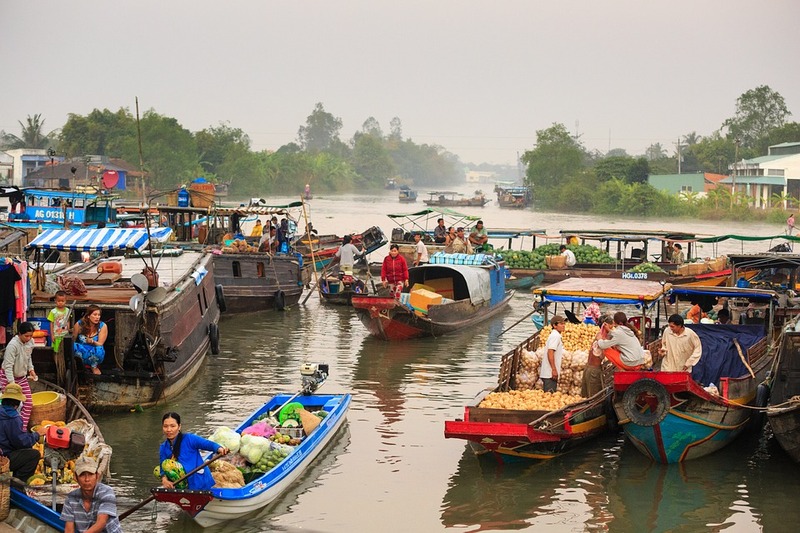 We hope our tips for women travelers in Vietnam have been helpful. Have a wonderful journey! Thank you for your comment! I was reading this again, after a few years, since I’ve been asked to write another guide on Vietnam. I appreciate your feedback. The Vietnamese are definitely among the most romantic people I’ve met on my travels. Viet people are really sweet in nature and they are really into love songs. I just find it cute that you were able to notice that while you were here.